MPF’s Board of Trustees has a collective eye on Mariemont’s future. We are excited to share with the Village and its administrators our contributions toward a comprehensive ‘Vision Plan’ to guide future Village development and redevelopment. This plan will create a defined roadmap for future projects. It has been nearly 100 years since the original John Nolen plan for Mariemont was released. We think a Vision Plan is a wise investment for Mariemont’s next 100 years and beyond. Vision Plan Committee members David Zack, Frank Raeon, Millard Rogers and Don Keyes worked on this initiative. Vision 2021 is a good example of what the Mariemont Preservation Foundation has been doing for more than 30 years – providing leadership and resources which have helped Mariemont remain a National Exemplar – a very special place for people to not only live, but to work, learn, and visit. 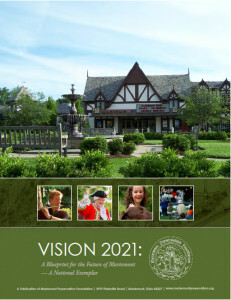 On September 26, 2011 the Mariemont Preservation Foundation formally introduced our recently published Vision 2021 document to local elected officials. Based upon a collaborative effort lasting more than two years, this important document is intended to act as a “blueprint” for guiding the future of the Village of Mariemont. Vision 2021 identifies a “basket of ideas” which includes 21 important Themes and 21 Priorities. MPF’s hope is that Village Council will, over a period of time, not only embrace but implement many, if not most, of its recommendations. Some important items which we think are worthy of becoming “next steps” include (a) hiring a full-time Village Administrator, (b) hiring a part-time Historic District Coordinator, (c) expanding our local tax base, (d) seeking grant monies, (e) updating the Village’s Zoning Code, and (f) the appointment of a representative, action oriented Vision Commission. Working closely with Village Council as well as with local boards and commissions, the primary responsibility of the 12-15 member Vision Commission will be two-fold: (1) to develop strategies, time frames, cost estimates, and implementation responsibilities, and (2) to periodically update Vision 2021. If you are interested in learning more about Vision 2021, please visit the Mariemont Preservation office at 3919 Plainville Road. You can also call MPF at (513) 272-1166 and purchase a copy of Vision 2021. The cost for purchasing this informative, handsome, and well illustrated 50 page booklet is only $10.00. (Mariemont Residents may purchase the booklet for $5.00). What is a Vision Plan? Visioning is a process for looking into the future in order to define both a community’s desired image and values. To create a plan – a “blueprint” or “roadmap” – which can subsequently be used to help guide future public and private investment in the Village during the next 10 years. MARIEMONT TREE PLANTING PROGRAM. How you can help! 2018-2019 MARIEMONT DIRECTORY & VILLAGE GUIDE is still available. Don't miss out on the opportunity to purchase this valuable Mariemont resource! Copyright © Mariemont Preservation Foundation 2017 - All rights reserved.